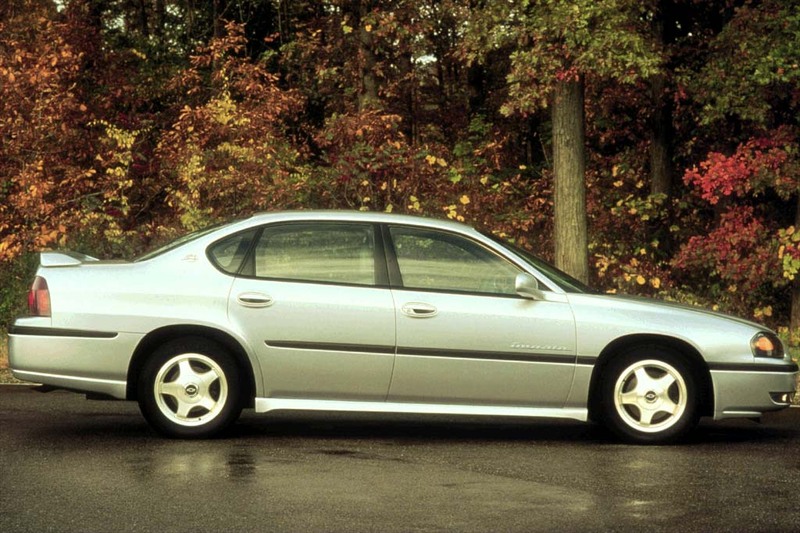 A clear alternative to the Ford Taurus (as redesigned for 2000), the Impala promises comfort-oriented American style as opposed to the Taurus’s import-influenced approach. Impala beats Taurus in powertrain response, while Ford leads in safety features and back-seat comfort. Both offer more room and equipment for the price than an equivalent Accord or Camry, though Japanese-brand rivals are more polished all-around. 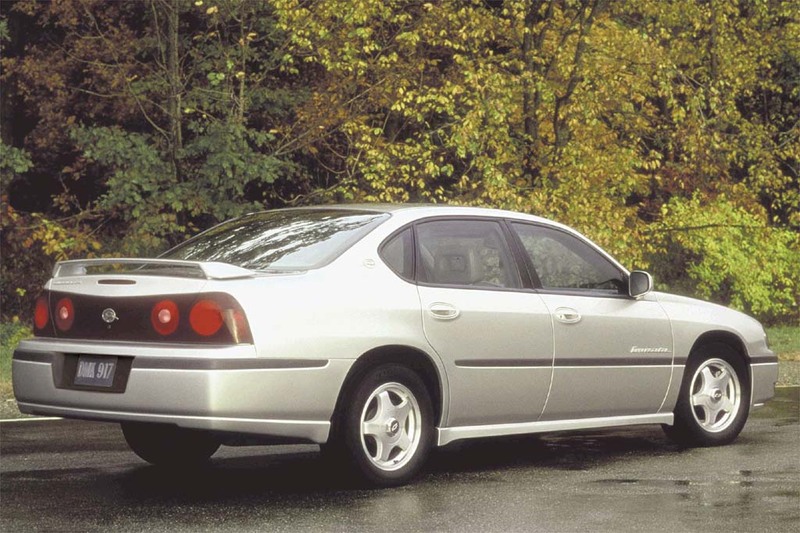 Chevrolet revived a famous old name when it issued a modern version of the Impala for 2000. The new front-drive midsize sedan was smaller in dimensions, sharing its basic understructure with the Buick Century and Regal, Oldsmobile Intrigue, and Pontiac Grand Prix. A 3.4-liter V6 engine was standard in the base model. 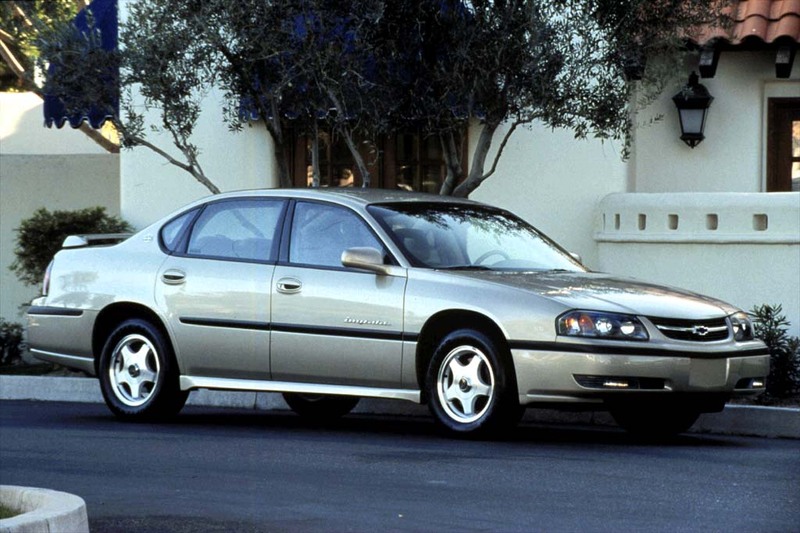 The upscale LS sedan got a 3.8-liter V6, which was optional on the base Impala. Both had a four-speed automatic transmission, four-wheel disc brakes, 16-inch wheels, air conditioning, power windows, and power door locks. A side-impact airbag for the driver was standard in the LS and optional in the base Impala. Also standard in the LS were antilock braking, a tire-inflation monitor, traction control, and a “firm-ride” suspension. Each of those extras also was included with the bigger-engine option for the base-model Impala. Leather upholstery was available for both models, including a split folding rear seatback. GM’s OnStar emergency/communications system also was optional. GM’s OnStar system became standard in the LS sedan and optional in the base model. Otherwise, no change was evident apart from a new emergency inside trunk release. Although Impala ranks as Chevrolet’s “traditional” midsize model, the less-costly Malibu sells far better. 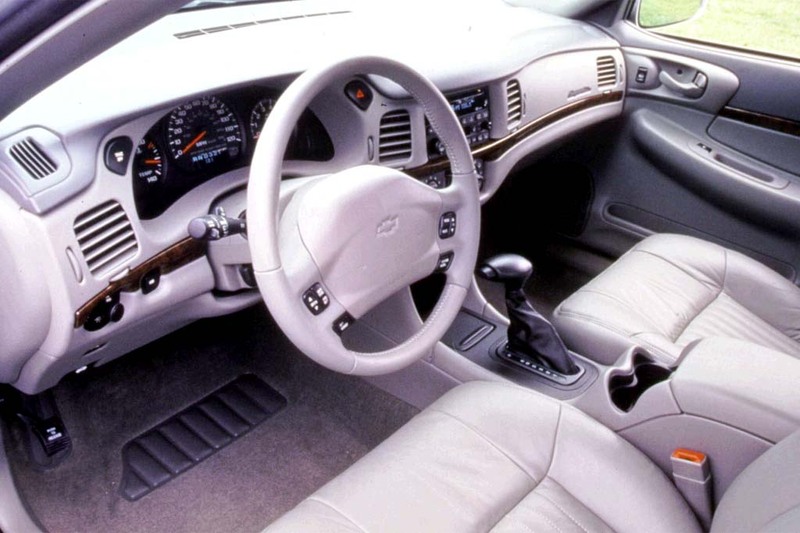 For 2002, the base model added dual-zone climate controls and a cassette player as standard equipment. Driver-side airbag and GM’s OnStar assistance system move from standard equipment to options on the LS, while the base Impala adds remote keyless entry. Newly available for both is XM satellite radio with 100-channel digital receiver. A supercharged version of the Impala, the SS, is new for ’04. It comes with a supercharged 240-hp 3.8-liter V6, sport suspension tuning, and 17 inch wheels. Standard OnStar assistance tops the short list of 2005 additions to Impala. The SS also includes 17-inch wheels vs. other models’ 16s; it offers chrome-finished 17s as a new option. Also new for SS are minor trim changes outside and different front headrests. SS and LS have front bucket seats and carry five passengers, though LS now offers a front bench seat for 6-passenger capacity. A 3.4-liter V6 in the base Impala produced 180 horsepower, versus 200 hp from the 3.8-liter engine in the Impala LS. Both engines mated with a four-speed automatic transmission. 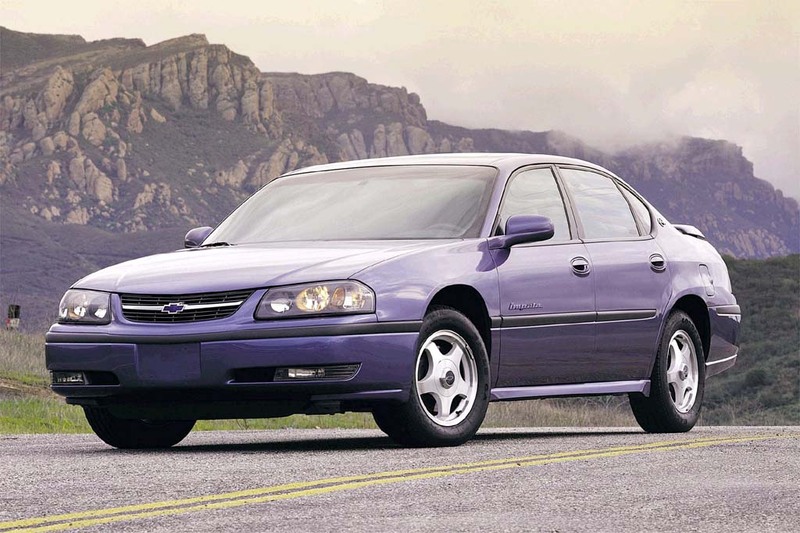 New for ’04 was the Impala SS, with a supercharged 240-hp 3.8-liter V6. Even though the modern-day Impala is a far cry from the V8-powered Super Sport of the distant past, or the Impala SS of the early ’90s, the sedan acquits itself nicely in most respects. Power is adequate with the base engine, while the 3.8-liter delivers usefully stronger takeoffs and passing response. An alert, smooth-shifting automatic transmission helps, but neither engine sounds smooth or refined when pushed hard. A 3.8-liter LS averaged 20.1 mpg, with a lot of highway mileage. In a more even mix of driving, a 3.4-liter Impala got 19.8 mpg. A good ride/handling balance makes this family four-door pleasing to drive. Even the Ride and Handling suspension that accompanies the bigger engine absorbs most bumps well, while tempering much of the float and wallow that plague the base suspension over high-speed dips. Any Impala furnishes good grip and balance, along with authoritative steering feel. Stopping power is good, though pedal feel could be firmer. Wind noise is low, but tire roar intrudes somewhat on coarse pavement. Space is sufficient for 6-footers to ride in tandem without cramping of legs. Still, there’s not quite enough seat width for three large adults. The back-seat cushion is far too soft and short, lacking in contour for satisfying comfort. Head room is good all around, even with an optional moonroof. Entry/exit is big-car easy, but tall-tail styling impedes rearward vision. The ample flat-floor trunk has a long, wide opening, but the glovebox is puny. Description: Seatbelt-buckle assemblies fail to conform to federal requirements, because buckle base was not properly heat treated. Description: On certain cars, airbag sensing and diagnostic modules could experience a memory error, and airbags might not deploy during a crash. Description: Airbag inflator may fracture and cause injury. Description: Both front brake caliper-to-steering knuckle attachment bolts may be inadequately tightened; if a bolt backs out or fractures, this can result in locking of the wheel during braking, abrupt steering input, reduced braking or steering control, noise, severing of brake hose, or increased brake-pedal travel. Cruise control, remote keyless entry, AM/FM/cassette, automatic day/night rearview mirror, map lights, overhead console w/storage, illuminated visor mirrors, cargo net. Preferred Equipment Group 1 plus manual dual-zone climate controls, steering-wheel radio controls, heated power mirrors, alloy wheels. Steering-wheel radio controls, Driver Information/Convenience Center (trip computer, compass, outside temperature indicator, universal garage door opener, theft-deterrent system w/alarm). Driver-side side-airbag, 6-way power driver seat, split folding rear seat. Requires Preferred Equipment Group. Custom Cloth Seat Trim plus front bucket seats, center console, additional cupholder. Requires Preferred Equipment Group. Custom Cloth Seat Trim plus leather upholstery. Requires Preferred Equipment Group, steering-wheel radio controls. NA with front bucket seats. Heated front seats, 6-way power passenger seat. Requires Leather Seat Trim, Base requires Preferred Equipment Group. Includes traction control, antilock brakes, tire inflation monitor, Ride and Handling Suspension. Requires Preferred Equipment Group, 225/60R16 touring tires, alloy wheels. Includes Global Positioning System, roadside assistance, emergency services. Requires annual service charge. Price may vary. Base requires Preferred Equipment Group. Trip computer, compass, outside temperature indicator, universal garage door opener, theft-deterrent system w/alarm. Requires Preferred Equipment Group. Requires Preferred Equipment Group 1 and Custom Cloth Seat Trim. Includes leather-wrapped steering wheel. Requires Preferred Equipment Group 1. Cruise control, remote keyless entry, AM/FM/cassette, overhead console w/storage, illuminated visor mirrors, cargo net. Preferred Equipment Group 1 plus OnStar System w/one year service (roadside assistance, emergency services; other services available), manual dual-zone climate controls, leather-wrapped steering-wheel w/radio controls, automatic day/night rearview mirror, alloy wheels. Driver-side side airbag, 6-way power driver seat, split folding rear seat. Requires Preferred Equipment Group. Heated front seats, 6-way power passenger seat. Requires Leather Seat Trim. Requires Preferred Equipment Group. NA w/bucket seats. Cruise control, remote keyless entry, AM/FM/CD player, overhead console w/storage, illuminated visor mirrors, cargo net. Preferred Equipment Group 1 plus OnStar System w/one year service (roadside assistance, emergency services; other services available), leather-wrapped steering-wheel w/radio controls, automatic day/night rearview mirror, alloy wheels. Steering-wheel radio controls, AM/FM/CD player, Driver-Information/Convenience Center (trip computer, compass, outside-temperature indicator, universal garage-door opener, theft-deterrent system w/alarm). Custom Cloth Seat Trim plus front bucket seats, center console. Requires Preferred Equipment Group. Custom Cloth Seat Trim w/bucket seats plus leather upholstery. Requires Preferred Equipment Group, steering-wheel radio controls. Heated front seats, 6-way power passenger seat. Requires Leather Seat Trim. Base requires Preferred Equipment Group. Includes traction control, antilock brakes, tire-pressure monitor, Sport Touring Suspension. Requires Preferred Equipment Group, 225/60R16 touring tires, alloy wheels. Trip computer, compass, outside-temperature indicator, universal garage-door opener, theft-deterrent system w/alarm. Requires Preferred Equipment Group, antilock brakes. Base requires Custom Cloth Trim. Base NA w/bucket seats. Includes premium speakers. Base requires Preferred Equipment Group. Requires Preferred Equipment Group 1. Cruise control, AM/FM/CD player, overhead console w/storage, illuminated visor mirrors, cargo net, floormats. 1SB Preferred Equipment Group plus 6-way power driver seat, leather-wrapped steering wheel w/radio controls, heated power mirrors, automatic day/night rearview mirror, alloy wheels. Steering-wheel radio controls, AM/FM/CD player, heated power mirrors, automatic day/night rearview mirror, cargo net, floormats. 1SB Preferred Equipment Group plus OnStar System w/one-year service (roadside assistance, emergency services; other services available), trip computer, compass, outside-temperature indicator, universal garage-door opener, antitheft system w/alarm. Leather upholstery, unique interior and exterior trim, floormats, special alloy wheels. NA w/front split bench seat. 6-way power driver seat, additional cupholders, split folding rear seat. Requires Preferred Equipment Group. Leather upholstery, driver-side front side airbag, additional cupholders (Base), split folding rear seat. Base requires Preferred Equipment Group 1SC, 6-way power driver seat. Base NA w/front bucket seats. Heated front seats, 6-way power passenger seat. Requires Leather Seat Trim. Base requires 1SC Preferred Equipment Group. Heated power mirrors, automatic day/night rearview mirror. Base requires 1SB Preferred Equipment Group. Includes traction control, antilock brakes, tire-pressure monitor, Sport Touring Suspension. Requires 1SC Preferred Equipment Group, 225/60R16 touring tires. Includes traction control, tire-pressure monitor. Includes one-year service (roadside assistance, emergency services; other services available). Trip computer, compass, outside-temperature indicator, universal garage-door opener, theft-deterrent system w/alarm. Base requires Preferred Equipment Group, antilock brakes. Requires 1SC Preferred Equipment Group, Custom Cloth Trim or Leather Seat Trim. NA w/front bucket seats. Includes center console. Requires custom cloth upholstery. NA w/6-way power passenger seat. Includes leather-wrapped steering wheel. Base requires 1SB Preferred Equipment Group. Requires 1SB Preferred Equipment Group. Cruise control, AM/FM/CD player, illuminated visor mirrors, cargo net, floormats. 1SB Preferred Equipment Group plus upgraded upholstery, 6-way power driver seat, leather-wrapped steering wheel w/radio controls, heated power mirrors, automatic day/night rearview mirror, alloy wheels. 1SB Preferred Equipment Group plus OnStar telematics system w/one-year service, trip computer, compass, outside-temperature indicator, universal garage-door opener, theft-deterrent system w/alarm. Cruise control, AM/FM/CD player, steering-wheel radio controls, heated power mirrors, automatic day/night rearview mirror, illuminated visor mirrors, cargo net. Unique interior and exterior trim, badging, chrome alloy wheels. Requires 1SB or 1SC Preferred Equipment Group. Rear spoiler, unique taillight treatment. Sport Appearance Pkg. GFO plus cruise control, upgraded upholstery, AM/FM/CD player, alloy wheels. Sport Appearance Pkg. PDE plus bucket seats. Leather upholstery, unique interior and exterior trim, floormats, special alloy wheels. 6-way power driver seat, additional cupholders, split folding rear seat, upgraded upholstery. Leather upholstery, 6-way power driver seat, additional cupholders, split folding rear seat. Base requires Preferred Equipment Group 1SC. Heated front seats, 6-way power passenger seat. Base, LS require Leather Seat Trim. Base requires 1SC Preferred Equipment Group. Unique interior and exterior trim, boost gauge, badging, chrome alloy wheels. Requires a Preferred Equipment Group. Base requires Preferred Equipment Group, Sport Cloth Trim. Includes illuminated visor mirrors. Requires Preferred Equipment Group. Includes Sport Cloth Trim. Requires Preferred Equipment Group 1SC. Base includes leather-wrapped steering wheel. Base requires 1SB Preferred Equipment Group. Cruise control, 6-way power driver seat, AM/FM/CD player, illuminated visor mirrors, cargo net, floormats. Steering-wheel radio controls, AM/FM/CD player, heated power mirrors, automatic day/night rearview mirror, trip computer, compass, outside-temperature indicator, universal garage-door opener, cargo net, floormats, alarm. Heated front seats, 6-way power passenger seat, steering-wheel radio controls, heated power mirrors, automatic day/night rearview mirror, trip computer, compass, outside-temperature indicator, universal garage-door opener, cargo net. Rear spoiler, bodyside moldings, alloy wheels. Leather upholstery, oil-pressure gauge, voltmeter, unique interior and exterior trim, floormats, special alloy wheels. Heated front seats, 6-way power passenger seat. Requires 1SB Preferred Equipment Group, leather upholstery. Base requires 1SB Preferred Equipment Group, sport cloth upholstery or bucket seats. Base requires 1SB Preferred Equipment Group. Includes upgraded upholstery, center console, split folding rear seat. Requires Preferred Equipment Group 1SB. Requires monthly fee after 3rd month.